You're Samsung. You easily have the world's leading line of smartphone. The Galaxy S3 sold millions upon millions. Hell, folks are still buying the Galaxy S2. What do you do with the follow-up, the Samsung Galaxy S4? If you're Samsung, you refine the hardware and pack even more features into the software side. We spent a little time with the new Galaxy S4 at Samsung's launch event in New York City, and one thing quickly became clear: For as awesome as the Galaxy S3 was, the Galaxy S4 is that much better. 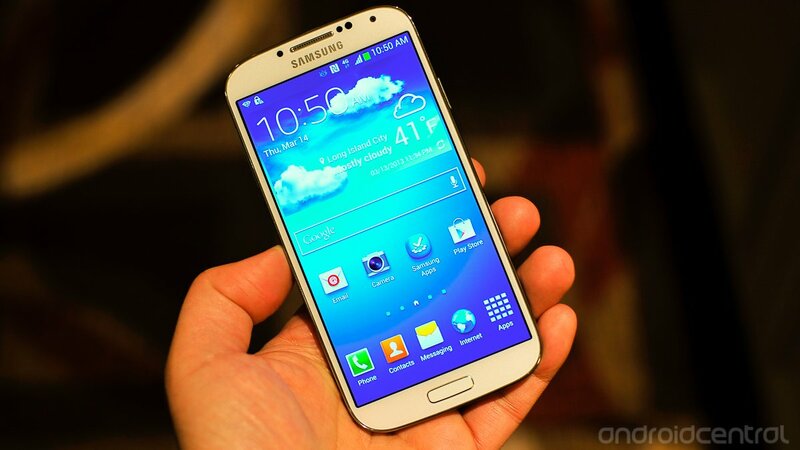 Let's go hands-on with the Galaxy S4. If you're looking for a radical redesign in the Galaxy S4, you're going to be disappointed. The overall look and feel of the GS4 is pretty much like the GS3. In fact, the phones have nearly identical footprints. The GS4 is a tad more narrow and ever so slightly slimmer. It's also lost a bit of its curve on the back. It's squarish, but not blocky. The volume rocker and power button are in their usual places on the sides of the phone. At the bottom you have a slightly redesigned physical home button -- it's a little bigger -- that's flanked by disappearing back and menu buttons. Functionality of the home button also is familiar -- long press for multitasking and Google Now, double press for S Voice. The display -- let's just say it's pretty damn gorgeous. But 1080p displays are like that, no? It's 5 inches in diagonal, covered in Gorilla Glass 3, crammed into the same form factor as the 4.8-inch Galaxy S3, and they've done it by shaving off the bezels. It's a sight to behold. The back of the phone's been redesigned a little bit. The speaker's moved to the bottom, and the flash is directly beneath the centered 13-megapixel camera lens. There's sort of a cool holographic design on the battery cover -- yes, the Galaxy S4 still has a removable battery -- that seems to shimmer when caught in the light. The internals have increased accordingly, as well. Depending on your region, the Galaxy S4 will either be powered by an Exynos 5 or a Snapdragon processor. You've got the requisite 2 gigabytes of RAM on board as well. The last physical difference is the addition of an IR blaster on the top of the phone, used for controlling televisions and components. We've seen that on the likes of the Galaxy Note 8.0 as well as other manufacturers' smartphones this year. This is where Samsung's really outdone itself on the Galaxy S4. For one thing, it's running Android 4.2.2 -- the most recently released version of Android. (A note: these units were very pre-production. Lag happens. We'd expect that to clear up by release.) TouchWiz has been refined -- there are some great new animations. And while it still might not be our favorite customization, Samsung continues to improve it, and that should be applauded. Samsung long has had excellent camera software (to say nothing of the equally good image quality), and improvements in the Galaxy S4 border on the ridiculously awesome. First up is the improved user interface that borrows heavily from the Samsung Galaxy Camera, which makes sense. Modes are easier to flip through. There are a host filters with which you can play artist to your heart's content, and Samsung's made it easy to switch between them and see them all at once. But one of our favorite toys is dual-recording, a sort of picture-in-picture mode that records from both cameras simultaneously. There are a number of options for the secondary recording -- a postage stamp, split screen, or a heart, etc. -- and you can flip between the front and rear cameras. Another great feature is "eraser mode," which can identify and eliminate unwanted photobombers. Highlight, touch and they're erased from history. This only works for still images. There are a number of other new features, including the ability to record 8 seconds of sound with an image, or "Drama shot," which combines a burst of images into a single image. "Story Album" groups together images based on a number of criteria, including geolocation, with Trip Adviser landing a hand here. Actually touching your phone is so 2012. Samsung's introducing "Air View" with the Galaxy S4 that lets you hover your finger to pop up previews. For instance: If you've got multiple tabs open in the browser, you can hover over the tabs button to preview all the hidden tabs, then tap the one you want to go to. Or in Samsung's e-mail browser (and not Gmail, unfortunately), you can hover over an individual e-mail to see a preview. It's pretty quick and more useful than we expected it to be. Samsung's flirted with gestures as actions for some time, and now it's doing so in the air. Waving your hand over the phone can trigger scrolling in the browser or gallery. It's kind of a goofy feeling, and it takes a little practice to make it work perfectly every time. It's also more work than simply using your thumb to flip through things. But, hey, it's cool. You can also answer phone calls with a simple wave -- Samsung envisions using that while driving. The overall theme of the Galaxy S4 is about making it a "life companion." And Samsung's now getting into the health and fitness world with S Health. In a nutshell, take the best features of apps like Endomondo or Fitbit, and that's what's built into S Health. It can, in the background, track your daily exercise habits, along with environmental factors such as temperature and humidity. Samsung also showed off a trio of accessories to go along with S Health -- a connected scale, wristband and heart-rate monitor. They connect to the phone via Bluetooth. Group Play: Connect up to eight Galaxy S4s via NFC and share music (imagine a half-dozen phones all playing the same song at the same time) and photos and what not. Samsung Optical Reader: Scan business cards and the like. Not a new technology, but it's built in. Samsung Adapt Display and Adapt Sound: Optimizing sound and screen on an app-by-app basis. Samsung WatchOn: Using the built-in IR blaster to control televisions. We've seen this built into other devices (Samsung and otherwise), and like other iterations it uses Peel to handle TV listings. So, yeah. While the hardware's been updated, and the design of the Galaxy S4 has been streamlined, the software is what really shines. The sheer number of new features are staggering. And for the most part, they're all pretty cool -- as well as useful. It's too early to call the Galaxy S4 an unmitigated success. But between what we've seen today and the Samsung marketing blitz we all know is coming, we can say this in full confidence: It's going to sell millions, and rightfully so. It's easily the best all-around smartphone money can buy.